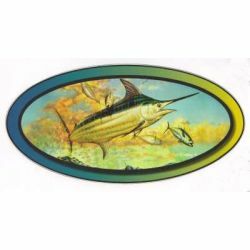 Game Fish Decal - Marlin and Tuna - Approximate Size: 6.5" x 10"
These beautiful 6 1/2 x 10 inch Marlin Tuna Surprise Oval decals by Perfect Images are printed on an outdoor vinyl, using UV-resistant ink and protected with a 5-year laminate. This production process makes our decals longer-lasting and weather resistant. 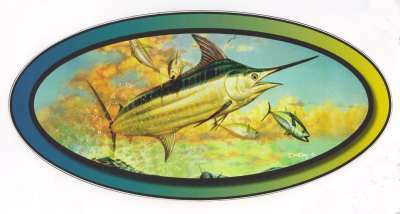 These decals will stick on any clean surface, making it easy for consumers to display on their boat, tackle box, car, etc."